“We have a long history in Allston-Brighton, so we know the area very well, and we consider this the best site available,” Percelay says regarding an opportunity he calls “very competitive” to rein in but worth the effort due to favorable physical aspects such as being a rectangular layout and offering “great visibility” along a main corridor running from Union Square to Newton and Watertown. Multiple bus lines, the Green Line subway and a new commuter rail station are all within walking distance of the building. Even more enticing, observes Percelay, is the location right where Allston’s 02134 zip code melds into Brighton’s 02135, i.e. the figurative “hyphen” so centered that its two most ambitious CRE undertakings are on either side of 103 North Beacon St. One is Boston Landing, the New Balance Corp. repositioning of an industrial wasteland into its headquarters plus training facilities for both the Boston Bruins and Boston Celtics with a blend of office and retail thrown into the pot. 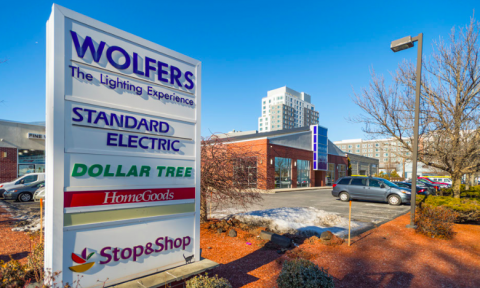 On the other side, Stop & Shop is teaming with New England Development to transform an aging retail plaza into a massive mixed-use ensemble of entertainment, multifamily and retail space anchored by a modern supermarket. Percelay, whose company just received approvals for a mixed-use project on the other side of Boston Landing across from the Charles River, says there are no immediate plans for altering 103 North Beacon St. “We are just taking our time and considering what makes the most sense there,” he says, one influence for the measured approach being the aforementioned flexibility for the asset beyond a residential project, among the most popular idea at present due to favorable regulations to increase the housing stock. For Allston-Brighton, however, thanks to the presence of major learning institutions including Boston College, Boston University and Harvard University, demand could be forthcoming for an alternative strategy, perhaps healthcare, laboratory or office space, outlines Percelay. Having the building 39 percent leased to Wolfers Lighting and another tenant also will deliver the needed cash flow while plans are formulated and permitted, Percelay says, enabling the calmer pace.